A new startup that analyzes legislative data has confirmed what we long suspected: female Senators are more productive, passing more bills than their male counterparts and working together more often to sponsor bipartisan measures. Democrats and Republicans in Congress generally blame the gridlock on each other; when the Republicans achieved a majority in both houses this year, Senate Majority Leader Mitch McConnell vowed to put things in working, "regular order." Meanwhile, as an analysis by The Quorum found, inspired by New York Times coverage about women in the Senate, women were spending less time blustering and more time doing. Female members of Congress, the Quorum wrote, "not only work more frequently with each other but also work more frequently across the aisle, passing more legislation in the Senate than their male colleagues." [F]emale senators in recent years have demonstrated more bipartisanship with other women than their male counterparts. The average female senator has cosponsored 3.79 bills with each female senator of the opposite party since the 111th congress, while the average male senator only cosponsored 2.16 bills with each male senator of the opposite party (p < .004). In addition, the average female senator cosponsored 171.08 bills sponsored by all members of the opposite party while the average male senator sponsored 129.87 bills that had a sponsor from across the aisle. The effect is stronger in the Senate than in the House, where female reps cosponsored "an average of 2.85 bills with another female Member while the average male representative only cosponsored 1.67 bills," the Quorum analysis found. The Quroum's co-founder told the Times he suspects the Senate's remarkable cooperation might have something to do with the quarterly bipartisan dinners the Senate women hold. 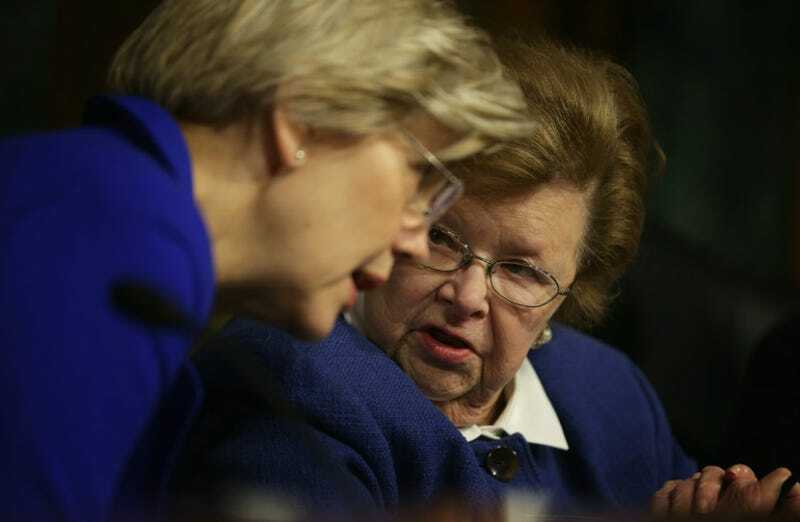 Senator Elizabeth Warren, left listens to Senator Barbara Mikulski (D-MD) during a hearing on before the Senate Health, Education, Labor and Pensions Committee, February 2015. Photo via Getty.